Importance. 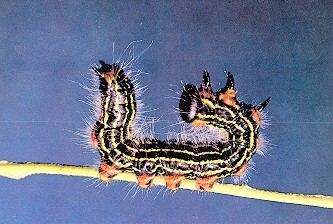 - This caterpillar is a defoliator of oaks and many other hardwoods throughout the United States. Infestations have been most common in the Appalachian and Ozark Mountains and their foothills. Damage is more severe among shade and ornamental trees than forest stands. Identifying the Insect. - The larvae are yellowish and black striped, and moderately covered with fine, white hairs. The head is jet black. The segment behind the head is bright orange-yellow - hence, its name, yellownecked caterpillar. Full-grown larvae are about 2 inches (50 mm) long. When disturbed, the larvae lift their heads and tails in a distinctive U-shape. This is a defensive measure to prevent parasitism by various wasps and flies. Identifying the Injury. - Newly hatched larvae skeltonize the leaf; older larvae devour all except the leaf stalk. Individual trees, or even stands, may be defoliated during late summer and early fall. Since defoliation is confined to the late part of the growing season, little damage is caused to the tree. Biology. - Moths appear during June and July and deposit white eggs in masses of 50 to 100 on the undersides of the leaves. Larvae feed in groups, maturing in August and September. Mature larvae drop to the soil and pupate at depths of 2 to 4 inches (50 to 100 mm), where they spend the winter. There is one generation per year. Control. - Natural enemies generally keep infestations in check. Chemical controls are occasionally needed.